This seminar is designed to prepare the prudent skipper for those unfortunate situations involving accidents and emergencies on board. It will provide the skipper with the information to prepare adequately for common emergencies and how to actually deal with them when they occur. Topics such as preventing accidents, running aground, fire, getting lost, towing, medical conditions, as well as other often-encountered emergencies are covered. 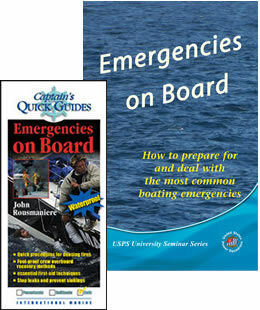 The seminar comes with the Emergencies on Board Quick Guide—a handy reference to use in responding to emergency situations. Each student also receives a full color Student Guide for the seminar.